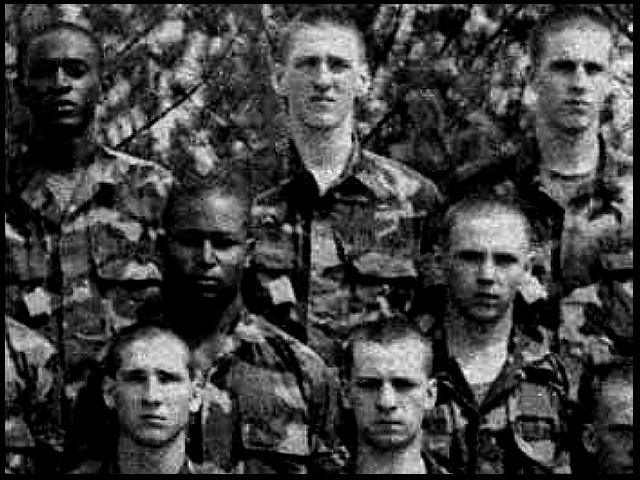 Timothy McVeigh, top center, with his platoon, Fort Benning, Georgia, 1988. The Oklahoma bombing exposed links between the Army and the militias. The militias use Army training grounds, buy their surplus weapons, and share a militarist mindset. After Timothy McVeigh was arrested in connection with the bombing of the federal building in Oklahoma City, a flock of reporters swooped down on anyone who had ever known him. One of McVeigh's high school classmates described him as "a quiet friendly teenager. I was thinking," she said after hearing of his arrest, "what happened to him between now and then." The next sentence of the Washington Post story began: "He joined the military after high school." While the military did not teach McVeigh to bomb, it did teach him to kill. The 1981 film "Soldier Girls" follows inductees through basic training and makes the point that the Army's heardest job is not to get these raw recruits to risk death, but to break down a visceral reluctance to kill people they don't know and don't hate. That job is harder in some cases than others. But whether the training brings out an inherent animal viciousness just below every human skin or destroys some benevolent instinct is beside the point. The result is a society in which millions of people have ben taught to cross a line. While most people emerge form the military as decent citizens, they bear the mark, some lightly, some deeply of having been indoctrinated by a highly efficient military machine in the belief that killing is a valid, even glorious, way to settle disputes and scores. They also learn the skills to do it efficiently. MORE TANGIBLE LINKS - Links between the Army and the militias became the focus of much unwanted attention when it was discovered that the two men charged with the federal office building bombing in Oklahoma City, Timothy McVeigh and Terry L. Nichols, had trained and served together for about a year with the First Infantry Division in 1988-89. McVeigh's service included combat duty as a gunner in a Bradley Fighting Vehicle in the Gulf, for which he was awarded a Bronze Star. Army officials at Ft. Riley, Kansas, where McVeigh and Nichols were station-ed, were quick to disassociate the military from the bombing. It's got nothing to do with the Army. No one [there] taught that young man to blow up federal buildings or day care centers, fumed Maj. Don Sensing, Army Criminal Investigation Command's public affairs officer. According to the Washington Post, the 500-member Kansas Militia claims to have recruited a number of members from the Ft. Riley area. The degree of involvement by reservists or active-duty GIs in the burgeoning militia movement is unknown at present. There is evidence that militia members or sympathizers have legally and illegally obtained weapons and explosives from military facilities and learned how to use them courtesy of the taxpayers. Stolen explosives and weapons, according to testimony of a Los Angeles police detective at a 1993 hearing of the Senate Governmental Affairs Committee, were allowing extremist groups to become better armed than law enforcement agents. At the same hearing, a Michigan National Guardsman admitted that for five years he had been stealing small arms parts and selling them to an Illinois gun dealer whose customers included David Koresh's Branch Davidian religious sect near Waco, Texas. In early 1987, five Ku Klux Klan members were charged by a federal grand jury in Raleigh, N.C., with conspiring to steal U.S. military weapons, explosives and rockets to equip a white supremacist paramilitary unit. In 1988, an associate of former Green Beret Lt. Col. and current Idaho-based militia leader James (Bo) Gritz, pleaded guilty to shipping 200 military plastic explosives by commercial airline for use in the Nevada desert to train Afghan rebels. In July 1994, members of the Blue Ridge Hunt Club, a militia in Virginia, were charged with plotting to plunder a National Guard armory for weapons and ammunition. For five years, Sen. John Glenn (D-Ohio) has been investigating the widespread theft of military equipment and weapons from various U.S. installations. He commented that while the military has improved control over sensitive weapons and supplies, you can't guarantee that TNT or blasting caps are immune from theft. Glenn's office released a General Accounting Office report on corrective actions taken by the Army to cure inventory and physical security weaknesses. It also noted that in July 1994, the Army's Criminal Investigation Command began an on-going vulnerability assessment for small arms, ammunition, and explosives. In addition to those obtained through theft, many weapons obtained by militias were bought openly from the military. Since 1993, 3.7 million pounds of outdated explosives have been sold by the Defense Department to citizens and companies with government licenses. A Pentagon official admitted that no checks are made to ensure that the lethal items are used for legal purposes. TRAINING - One crossover point for the militias and the military is a nationwide network of gun clubs. After the bombing, Michigan Militia leader Mark Koernke bragged to ABC-TV's Primetime Live that his group enjoyed unrestricted access to Camp Grayling for target practice. A week later, some members of the Michigan Militia, which claims 10,000 members spread out over three-quarters of the state's counties, were evicted. They had been using the rifle range at the training base under the guise of the Competitive Sportsmen, a military-sanctioned gun club. The Competitive Sportsmen is one of 1,945 registered gun clubs allowed to use target ranges at military bases without charge, as part of the Army's Civilian Marksmanship Program (CMP). This gun lovers' bonanza was established after the Spanish American War because military leaders like Teddy Roosevelt were disturbed by the poor marksmanship skills of their soldiers. In 1989, about 165,000 people (with 41 percent under 21 years old) participated in various aspects of the program. An Army spokesperson for CMP described it as an innocent recreational affair that promotes civic virtue and aids safe training for young people. Even though the Pentagon has admitted that the $2.5 million a year civilian marksman program has no military purpose, it has been preserved thanks in part to strong backing by the National Rifle Association. For the last three years, Rep. Carolyn Maloney (D-N.Y.) has fought to scrap the program as useless and wasteful. After the Oklahoma City bombing, she called on Defense Secretary William J. Perry to conduct an immediate investigation of any links between this program and militia groups and individual extremists, and provide a complete list of registered gun clubs, and locations of the military bases on which they practice. According to Maloney's legislative aide, Mark Stephenson, the DoD sent a list of gun clubs, did not find evidence of links, and did not provide a list of bases. Although the base commanders would prefer that the knowledge not become public, said Stephenson, by statute, target ranges are open to all people `capable of bearing arms.' In addition to free use of the ranges, CMP distributes 40 million rounds of free ammunition and sells 6,000 surplus M-1 rifles at cut-rate prices each year. After the wave of criticism threatening program funding, Rep. Paul Gilmore (D-Ohio) introduced language that would make the program financially self-sustaining but still under DoD aegis. Presumably, Stephenson speculated, the NRA would pick up most of the tab. EXTREMIST ON ACTIVE-DUTY? - The attention brought to the use of military bases and equipment by civilian militia was not the only effect of the Oklahoma bombing on the military. The Pentagon is also worried that the military provides not only material aid, but also organizational comfort to some of the worst elements in the militias. Similar and sometimes linked strains of organized white supremacism are found in both government-sponsored and civilian military formations. A few days after the April 19th bombing, Perry reissued a 1969 Defense Department Directive to all service branches. It provides, in part, that: Military personnel must reject participation in organizations that espouse supremacist causes ... or advocate the use of force or violence. Commanders are empowered to deal with such activity with a range of responses from court-martial to involuntary discharge. While this directive was originally aimed at anti-Vietnam War soldiers and sailors and coffee house organizers, in recent years it has been primarily directed at GIs who support para-Nazi and white supremacist causes. There is a long history of such associations. In 1976, a Ku Klux Klan chapter was uncovered among Marines serving at Camp Pendleton, California. A cross was burned near the base and at least two black Marines on base were attacked by whites wearing Klan insignia. Marine Cpl. Daniel Bailey, Jr., who identified himself by his Klan rank, Exalted Cyclops, told reporters that a hundred Marines belonged to the branch. The Marine Corps had suppressed any information about the Klan's activities until a group of black Marines attacked a white gathering in the (mistaken) belief that it was a Klan meeting. During their courts-martial, the black Marines testified that their commanders had tolerated the flaunting of Klan regalia, had allowed the distribution of racist literature, and had ignored attacks on black Marines by Ku Klux Klan members. While most of those convicted received some jail time and other-than-honorable discharges, white Marines suspected of Klan sympathies were simply shipped out to other duty stations. 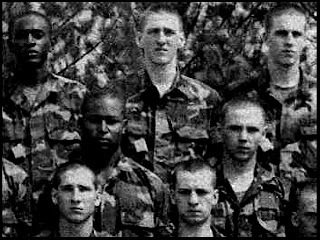 Further light was shed on organized racist groups within the military in 1985 when it was discovered that the White Patriot Party of North Carolina was successfully recruiting Marines and soldiers. According to the New York Times, a number of the neo-Nazi sympathizers within the military were identified after they sold Claymore mines, rockets, grenades, and small arms to undercover agents in a sting operation. Three of the service members were dishonorably discharged. IDEAL RECRUITING GROUNDS - The road between the militias and the military is a two-way street with the National Guard and Reserve as a convenient way station. The tragic events in Oklahoma City have heightened the concern of all National Guard and Reserve commanders that militia members may be infiltrating their ranks in order to gain skills and equipment. The militias are also looking to those official weekend warriors with military skills and right-wing views as natural targets for recruiting. Clearly, the Army is not ignorant of the possibilities. In Michigan, home of the largest militia, the Army National Guard's adjunct general warned members that they are not allowed to belong to racist or extremist organizations. But some Guard units are more solicitous of their local militias. After an incident involving an Idaho National Guard helicopter overflying a Montana militia group, Idaho officials agreed to notify their Montana counterparts in advance of any future flights. It is impossible to tell exactly how many Guard members and reservists also belong to locally-organized militias. The situation at Ft. Drum, home of the 10th Mountain Division in upstate New York, illustrates the difficulty of trying to keep militia members away from military training and combat weapons, even if there is a will to make such a separation. Each year, 35,000-40,000 National Guard members and reservists from all over the Northeast train there for varying periods. It would be impossible to monitor individual trainees to determine which ones were planning to apply their instruction in support of their home town militia. Col. Robert R. Waters (Ret.) is a career Green Beret who now edits a special operations journal called Behind the Lines. He told Army Times that he believes the militia movement is gaining momentum. He also raises a disturbing scenario: Obviously, they're going to seek [specialized] training from those who can provide it. The militia phenomenon arises out of a toxic stew of legitimate anger, scapegoating, and paranoia. Its links to the military, and the support of the taxpayers are more than an irony for a group which openly despises the government. But the militias and the military have much in common aside from their obvious predilection for weaponry and the violent resolution of conflict. Like the militias, the U.S. military has always attracted more than its fair share of right-wing extremists and white supremacists. Its rigid structure and rules probably appeal to those whose personalities tend toward authoritarianism. Without understanding these common bonds, as well as the physical links, civil society will never be able to understand, much less root out, irrational acts of violence like Oklahoma are calculated declarations of adventurous war.